China, 1837 (Jun. 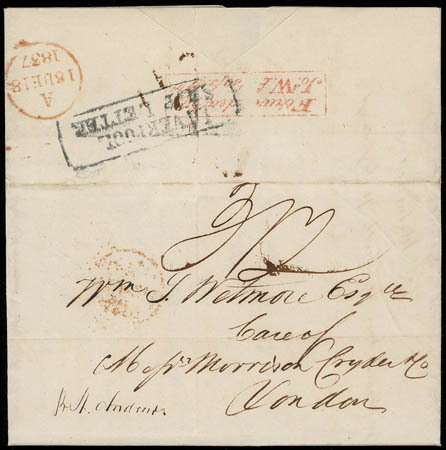 15) Canton, China to London, England via St. Helena, folded letter datelined "Canton June 15. 1837" from Wetmore & Co. to William Wetmore care Messrs. Morrison Cryder London, inside endorsed "Pr. Bencoolen via St. Helena", endorsed "Pr. St. Andrews" at bottom left, back flap with red "Forwarded by Joa. W.Alsop Jr." framed handstamp, black "Liverpool, Ship Letter" framed handstamp and manuscript "3/2" due rating, London (12.18) arrival backstamp, letter concerns trading matters and sailing info; horizontal fold, Very Fine. A link back to Sale 74 - Lot 553, along with its description, will be appended to your message.